This thesis investigates doubling and agreement in the nominal domain in Romance and Germanic. In Swedish, Norwegian, and Faroese, the definite article is doubled in case an attributive adjective modifies the noun. This doubling is known as double definiteness. This thesis proposes that double definiteness is the result of an intriguing interaction between the syntactic and morphological components of the grammar. The absence of double definiteness in other Germanic languages is attributed to morphological variation concerning the definite article. The main part of the thesis deals with the distinction between strong and weak adjectival inflection in the Germanic languages and its absence in the Romance languages. This thesis proposes that agreement on attributive adjectives is always licensed indirectly, through the help of a mediating element. In the case of Germanic weak adjectival inflection this mediating element is partially deactivated for independent reasons. In the case of Germanic strong adjectival inflection as well as Romance adjectival inflection, this mediating element is however always fully active. 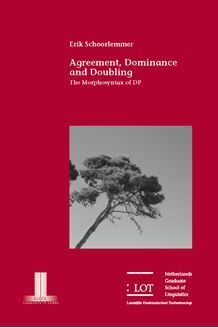 On the theoretical level, this thesis proposes that the syntactic configuration in which agreement can occur is best defined in terms of dominance and not in terms of c-command as proposed by Chomsky (2000, 2001). It is argued that a definition in terms of dominance is both theoretically simpler as well as empirically more adequate than a definition in terms of c-command.